British Prime Minister Theresa May Britain’s parliament went into lockdown on Wednesday as a police officer was stabbed and the alleged assailant shot, reportedly after ploughing down pedestrians on one of London’s busiest bridges. Here is what we know about what police are treating as a terrorist attack: British Prime Minister Theresa May – What happened? – In quick succession at around 2:40 pm (1440 GMT) on Wednesday, media reported gunfire outside the parliament and, separately, that several people had been injured in an incident on Westminster Bridge next to it, a busy traffic conduit that is also a popular tourist spot due to its views of parliament and its “Big Ben” clock tower. David Lidington, a government minister who is the leader of the lower House of Commons, told the chamber that a police officer had been stabbed on the parliamentary estate and that armed police had shot the alleged attacker in response, adding that there had been “reports of further violent incidents in the vicinity”. Unconfirmed media reports said the attacker mowed people down on the bridge in a car before veering towards the parliament building and ramming the railings surrounding the grounds. He got out and attacked the police officer before he was shot. Reports said the attacker was carrying a large knife. One woman was killed, according to medics cited by local media, and several suffered “catastrophic” injuries. – How did authorities respond? – Parliament was put on lockdown, with lawmakers and staff ordered to remain inside. 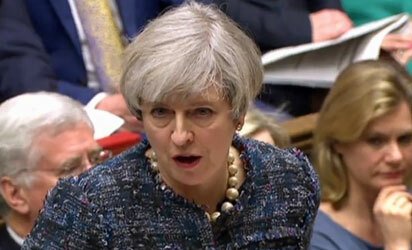 Downing Street said Prime Minister Theresa May was safe, and she was seen getting into a car and being driven away from the parliament where she had been holding her weekly question-and-answer session a couple of hours earlier. Television pictures showed a red air ambulance landing on the grass square opposite the parliament building and other emergency vehicles swarming nearby roads. Westminster Bridge and the Westminster Underground station which serves parliament and the surrounding political district, were closed off. – What is known about the attacker? – For the moment, very little. Witness reports, which could not be immediately confirmed, described a middle-aged man of Asian appearance who was carrying a large knife. – Has anything like this happened in London before? – London’s transport system was hit by four co-ordinated suicide bomb attacks in July 2005 that left 52 people dead, carried out by British attackers inspired by Al-Qaeda terror network. There was an attempted second wave of attacks two weeks later. In 2013, two Islamic extremists killed soldier Lee Rigby on a London street by hitting him with a car before attempting to behead him. Last August, a paranoid schizophrenic knifeman who tried to behead a commuter in a London Underground station in an Islamic State-inspired attack was sentenced to life behind bars. In terms of attacks on parliament, Airey Neave — the shadow Northern Ireland Secretary and a close friend of Conservative Party leader Margaret Thatcher — was killed by an Irish National Liberation Army car bomb in the House of Commons car park.​​ The latest incident comes with Europe on high alert after a series of deadly jihadist attacks, including the Brussels bombings exactly a year ago on March 22, 2016.